ATP synthase. The membrane is shown schematically in gray. ATP synthase is one of the wonders of the molecular world. ATP synthase is an enzyme, a molecular motor, an ion pump, and another molecular motor all wrapped together in one amazing nanoscale machine. It plays an indispensable role in our cells, building most of the ATP that powers our cellular processes. The mechanism by which it performs this task is a real surprise. ATP synthesis is composed of two rotary motors, each powered by a different fuel. The motor at the top, termed F0, an electric motor. It is embedded in a membrane (shown schematically as a gray stripe here), and is powered by the flow of hydrogen ions across the membrane. As the protons flow through the motor, they turn a circular rotor (shown in blue). This rotor is connected to the second motor, termed F1. The F1 motor is a chemical motor, powered by ATP. The two motors are connected together by a stator, shown on the right, so that when F0 turns, F1 turns too. So why have two motors connected together? The trick is that one motor can force the other motor to turn, and in this way, change the motor into a generator. This is what happens in our cells: the F0 motor uses the power from a proton gradient to force the F1 motor to generate ATP. In our cells, food is broken down and used to pump hydrogen ions across the mitochondrial membrane. The F0 portion of ATP synthase allows these ions to flow back, turning the rotor in the process. As the rotor turns, it turns the axle and the F1 motor becomes a generator, creating ATP as it turns. Remarkably, cells build similar molecular machines, such as the vacuolar ATPase, that work in reverse, using an ATP-driven motor to pump protons across a membrane. Large, complex molecular machines like ATP synthase pose difficult problems for structural scientists, so the structures of these machines are often determined in parts. The picture shown here is a composite of four different structures, combining structures determined by X-ray crystallography and NMR spectroscopy. The F0 motor is included in PDB file 1c17 . The F1 motor and the axle that connects the two are included in PDB file 1e79 . The stator has proven to be the most elusive part--the two pieces shown here are from PDB files 2a7u and 1l2p . For information on ATP synthase from a genomics perspective, take a look at the Protein of the Month at the European Bioinformatics Institute. PDB entry 1e79 includes the F1 motor of ATP synthase. When operating as a generator, it uses the power of rotational motion to build ATP, or when operating as a motor, it breaks down ATP to spin the axle the opposite direction. The synthesis of ATP requires several steps, including the binding of ADP and phosphate, the formation of the new phosphate-phosphate bond, and release of ATP. As the axle turns, it forces the motor into three different conformations that assist these difficult steps. Two states are shown here. The one on the left shows a conformation that assists the binding of ADP, and the one on the right shows a conformation that has been forced open to release ATP. Notice how the oddly-shaped axle forces the change in conformation. PDB entry 1c17 includes the F0 electric motor. In this picture, we are looking down the axis of rotation, as if we where looking down at the top of the picture on the first page. 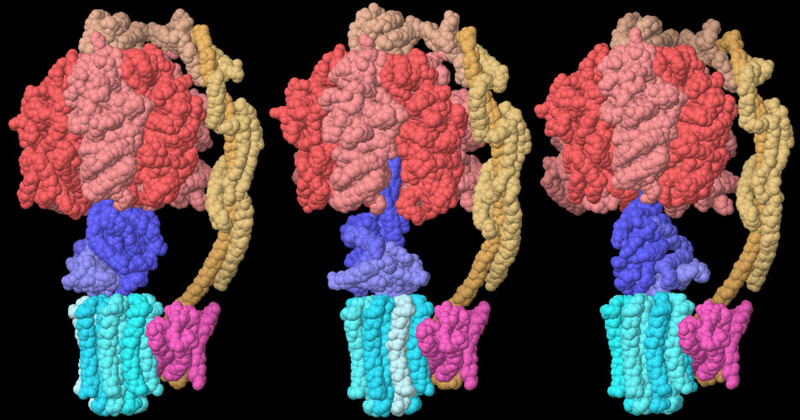 The rotor is composed of 12 identical protein chains, colored blue here, and the ion pump is a single chain, colored red. The pump has an arginine amino acid that hands off a hydrogen ion to aspartates on the rotor. Aspartate amino acids typically have a negative charge, but since the rotor is surrounded by membrane lipids, this would be very unfavorable. So, the rotor only turns when the aspartates have a hydrogen attached, neutralizing their charge. Hydrogen ions take a convoluted path through the F0 motor, turning the rotor in the process. They are gathered by a chain of amino acids in the pump, and transferred to the arginine. The arginine passes the hydrogen to the rotor, which turns all the way around. Then the hydrogen is offloaded by other amino acids on the pump, and finally passed to the opposite side of the membrane. The exact path of the hydrogen ions through the pump is still a matter of intense study. Dimeric complex of ATP synthase. 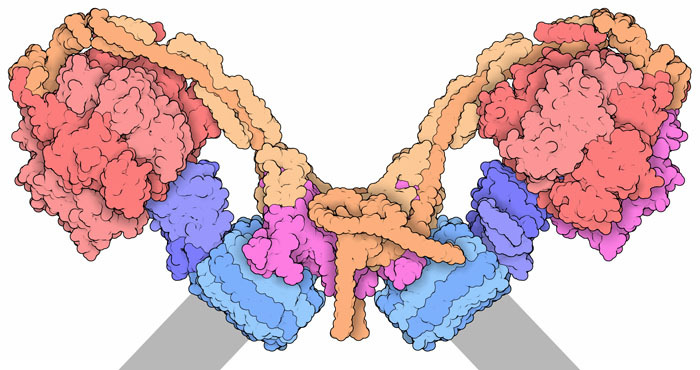 Cryoelectron microscopy has been used to determine the entire structure of ATP synthase. The resolution of these studies is not quite enough to see individual atoms, but it allows us to arrange all the subunits in their proper places. One of the surprises from this work is that the ATP synthase in our mitochondria forms a dimer, and the dimer is sharply bent. This is thought to help shape the extensively folded inner membrane of the mitochondrion. The structure shown here is from yeast mitochondria (PDB entry 6b8h). To determine a structure by cryoelectron microscopy, researchers scatter many copies of the molecule on a surface, and then combine images of thousands of them to build up a coherent structure. In some cases, the molecules adopt several different shapes, so by classifying these images correctly, researchers can observe different conformations of the molecule. With a monomeric form of cow ATP synthase, researchers found seven different rotational states. Three are shown here (PDB entries 5are, 5ari & 5fil), capturing a full rotation. To explore these structures in more detail, click on the image for an interactive JSmol. Try looking at the PDB-101 topic “Biological Energy” to see other proteins involved in generation and usage of ATP. 6b8h: H Guo, SA Bueler & JL Rubinstein (2017) Atomic model for the dimeric FO region of mitochondrial ATP synthase. Science 358: 936-940. 5are, 5ari, 5fil: A Zhou, A Rohou, DG Schep, JV Bason, MG Montgomery, JE Walker, N Grigorieff & JL Rubinstein (2015) Structure and conformational states of the bovide mitochondrial ATP synthase by cryo-EM. Elife 4, e10180. 2a7u: S Wilkins, D Borchardt, J Weber & AE Senior (2005) Structural characterization of the interaction of the delta and alpha subunits of the Escherichia coli F(1)F(0)-ATP synthase by NMR spectroscopy. Biochemistry 44, 11786-11794. G Oster and H Wang (2003) Rotary Protein Motors. Trends in Cell Biology 13, 114-121. 1l2p: PA Del Rizzo, Y Bi, SD Dunn & BH Shilton (2002) The “second stalk” of Escherichia coli ATP synthase: structure of the isolated dimerization domain. Biochemistry 41, 6875-6884. 1e79: C Gibbons, MG Montgomery, AGW Leslie & JE Walker (2000) The structure of the central stalk in bovine F(1)-ATPase at 2.4 A resolution. Nature Structural Biology 7, 1055. G Oster & H Wang (1999) ATP Synthase: Two Motors, Two Fuels. Structure 7, R67-R72. 1c17: VK Rastogi & ME Girvin (1999) Structural changes linked to proton translocation by subunit c of the ATP synthase. Nature 402, 263-268. PD Boyer (1997) The ATP Synthase--A Splendid Molecular Machine. Annual Review of Biochemistry 66, 717-749.